Sonny Rollins is one of my favorite musicians, and I’ve always loved playing his tune, Oleo…at least the melody. It is based on rhythm changes, the 32-bar AABA form chord progression borrowed somewhat from the old tune “I’ve Got Rhythm,” which is arguably the second most common harmonic form improvised over by jazz musicians (after the 12-bar blues). Each of those forms has seen a countless number of harmonic variations. My problem with rhythm changes is that, even when you use more chromatic harmonies in the tune’s A section, the tonal center remains fairly static, and that the most popular solutions for creating something of interest are usually accomplished by playing the song at a much faster tempo, with pre-practiced, pattern based improvising. The bridge offers a nice contrast, especially’s Sonny’s variation of chromatically descending dominant 7th chords, but still, harmonically, it is not the most interesting tune in the jazz repertoire. Now Sonny’s melody is another story. The opening three note motif immediately creates interest with a polyrhythm, and when played again with an expanded interval, suggests two measures of 3/4 time…all while the piece remains in 4/4 time. Recently I have thought about not only reharmonizing this tune, but also replacing the original’s more common harmonic rhythm of two chords per measure with new chords that would keep pace with this polyrhythm. However, an interesting thing happened during the process…by extending the 3/4 polyrhythm even further with the new harmonic rhythm, I discovered the melody (still untouched) actually fit the 3/4 meter quite well! Adding two beats to the end of the original tune’s first four measures (16 beats total) created six measures of 3/4 (18 beats), which also gave the phrase’s ending a little more breathing room than the original. For a printable PDF version of this version (seen below) click here: Oleo Nouveau. Changing a 4/4 song’s meter to 3/4 is nothing new when it comes to arranging, but that process usually involves changing the original melody’s rhythm in order to fit the new meter’s bar lines. In the case of Oleo, that step was not necessary…even the second four measure phrase fit the new time signature quite nicely (and required only the same additional two beats at the end of the phrase, occurring after the melody had played out). To anyone already familiar with Oleo, playing the tune in it’s new metric garb, and with a strong, swinging conviction, still can make you feel like you’re in 4/4 time…at first. The head of the tune can be played with a walking bass, but I prefer the feeling of “one” (unless the harmonic rhythm dictates otherwise)…which gives the piece a looser, more fragmented feel, especially since most of the phrases are no longer four bars in length. The final motif of the melody leads a double life, sounding just as comfortable as the end of the second ending, or being the first motif of the tune’s bridge at letter B. Most chords now last for an extra beat…three total, instead of the original progression’s two beats per chord…giving the improviser a little more breathing room (even at faster tempos), and I find it’s now much easier to work with the tune’s wonderful melodic motifs. The original and even Sonny’s bridge, had a symmetrical harmonic progression working it’s way back to the final A. I wanted to honor that tradition, but came up with a cycle of descending major 7th chords (instead of the original’s sequence of II-Vs, or Sonny’s dominant 7ths). Like Sonny, I kept the bridge devoid of any written melody. While the original seemed to be too populated with Bb chords (and diatonic chords from that key), my version never plays a tonic Bb chord, and alludes to other tonal centers (although Bb never seems far away). Because of this, I can imagine several ways of ending the tune, although none seem to be the definitive choice at the moment. As you become familiar with this reharmonization, you’ll most likely see (and hear) what I mean. Have fun! 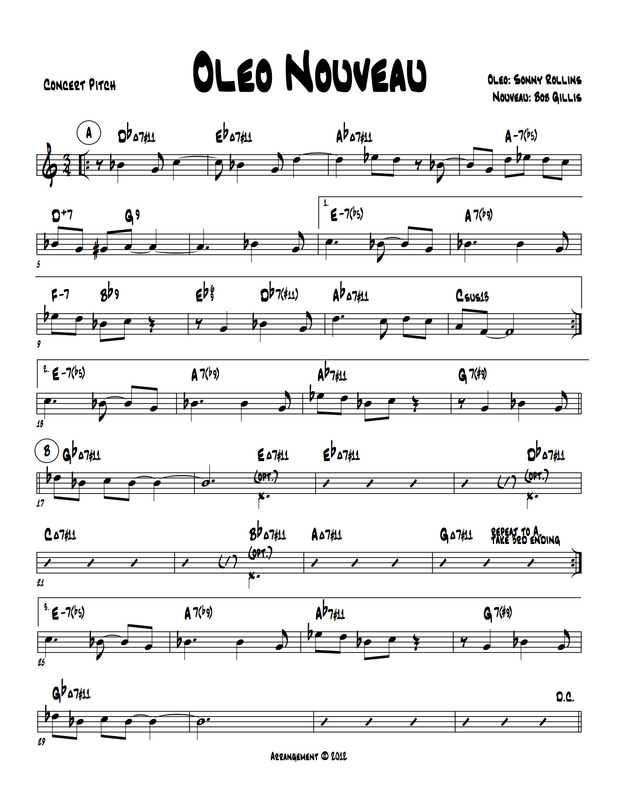 This entry was posted in Composing, Composition Lessons, Improvisation Lessons and tagged Oleo by Sonny Rollins, Reharmonizing Rhythm Changes, Rhythm Changes, Sonny Rollins. Bookmark the permalink.